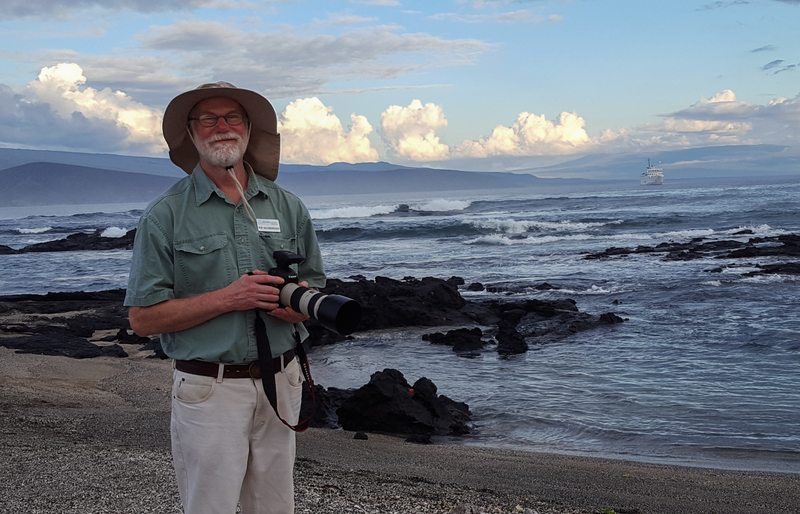 As promised, here are a selection of my husband Rob Goldsborough’s beautiful photographs from our recent trip to the Galapagos Islands. 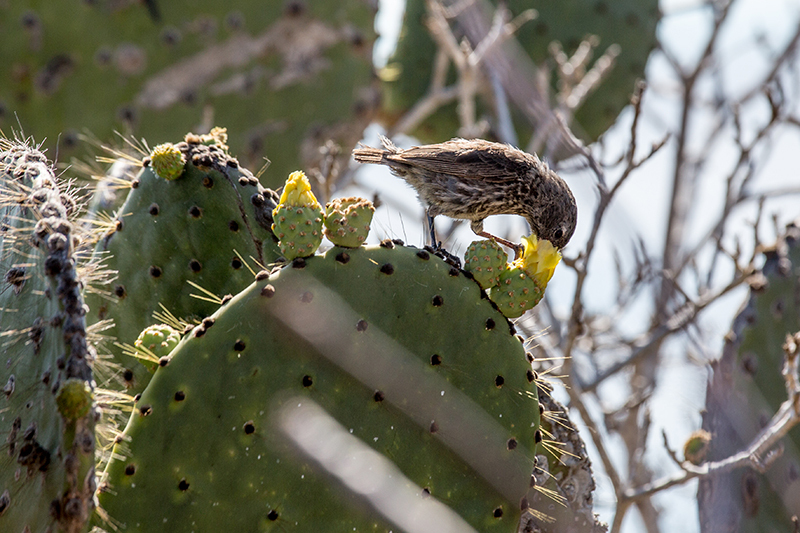 The one above of a Galapagos finch is one of my favorites. 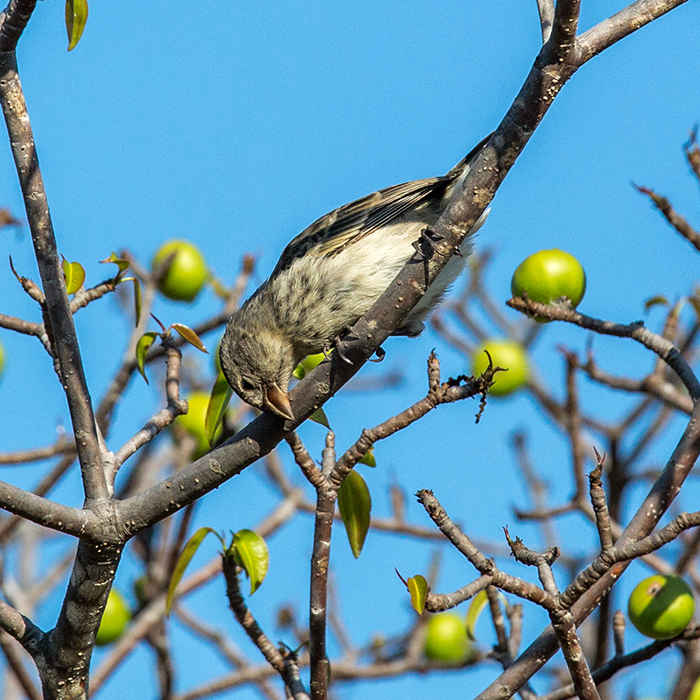 These finches played an important role in the development of Darwin’s theory of natural selection. We went on daily excursions in inflated pangas from our mother ship. 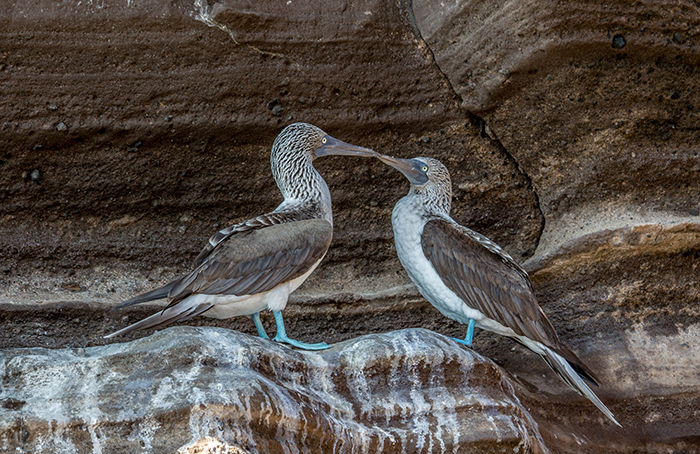 as were Blue-footed Boobies – the bluer their feet, the healthier they are. This young sea lion was almost oblivious to my presence. 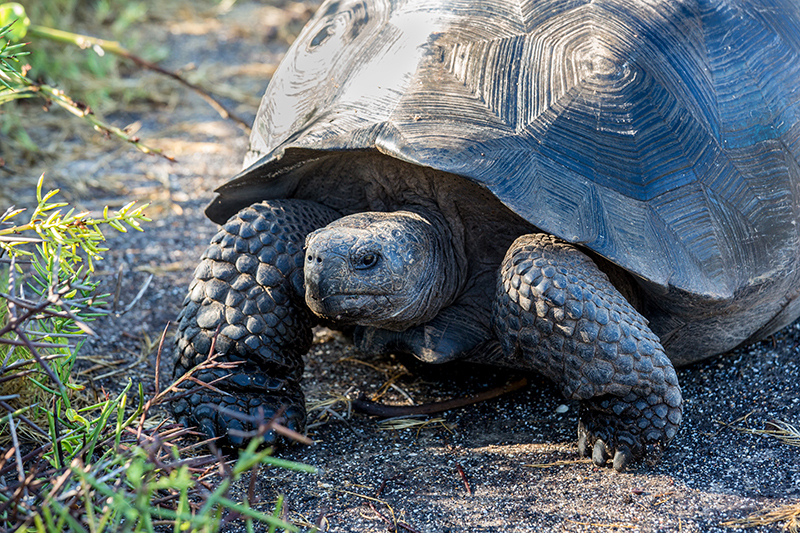 We saw many giant tortoises lumbering along. 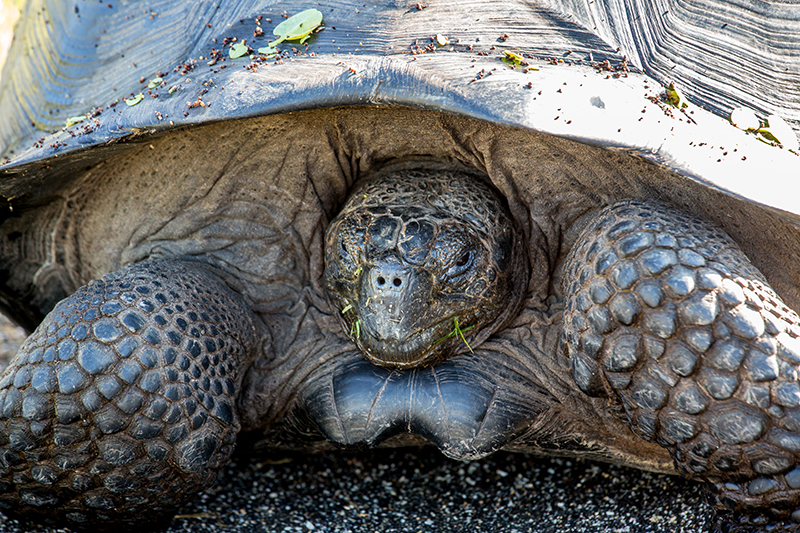 The islands were named after the Spanish word for tortoise, “galapago”. 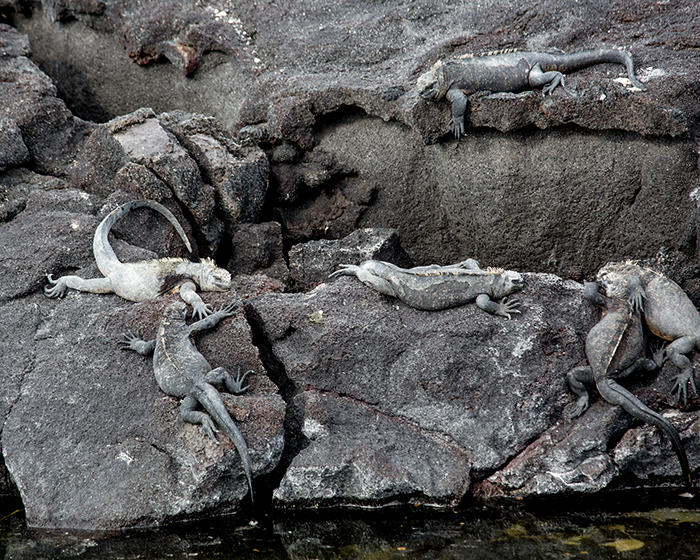 This iguana species is the only extant (or still existing) marine lizard on Earth. 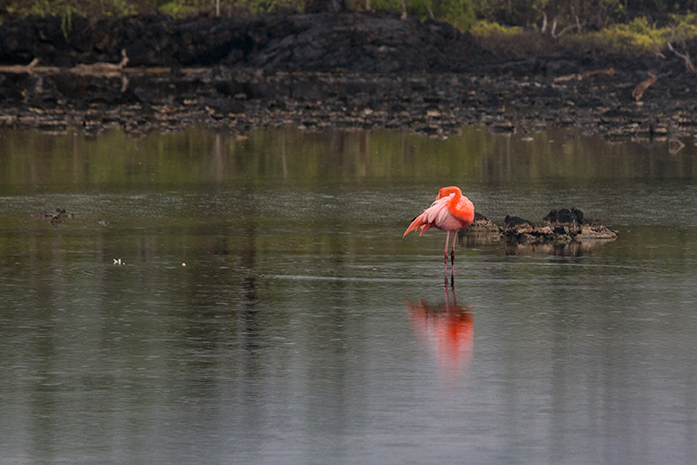 We saw one flamingo in a shallow pond. 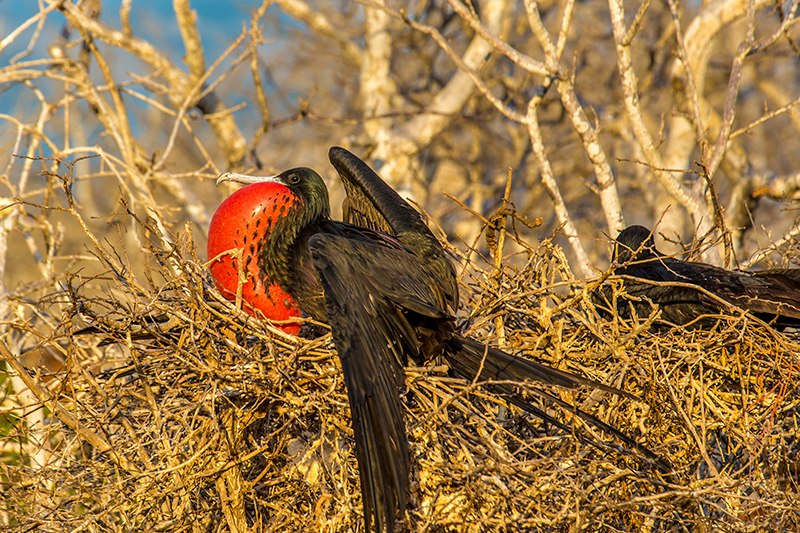 Magnificent frigate-birds dominated the sky..
and showed off their red throat pouches on land. 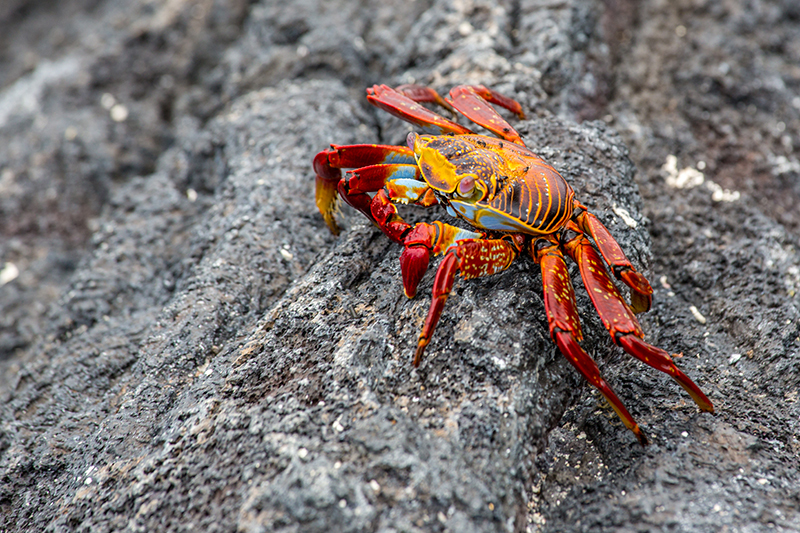 Sally Lightfoot crabs danced over the rocks at the sea shore. 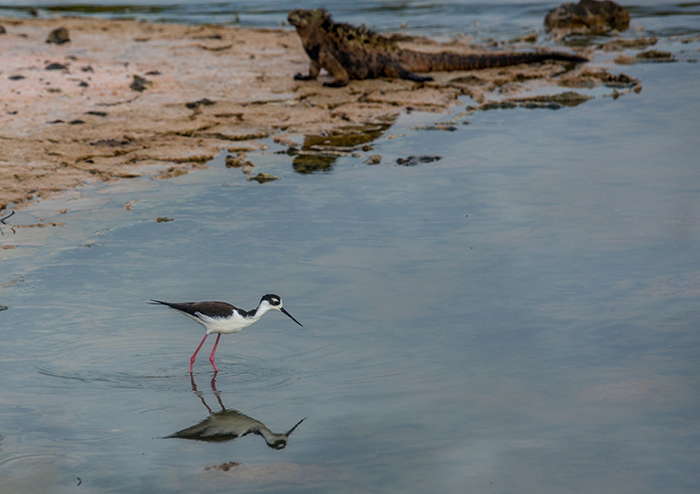 This Black-legged Stilt waded, while an iguana crawled ashore. I hope that you’ve enjoyed the tour. Polly went along, too and you can see her travel log here. 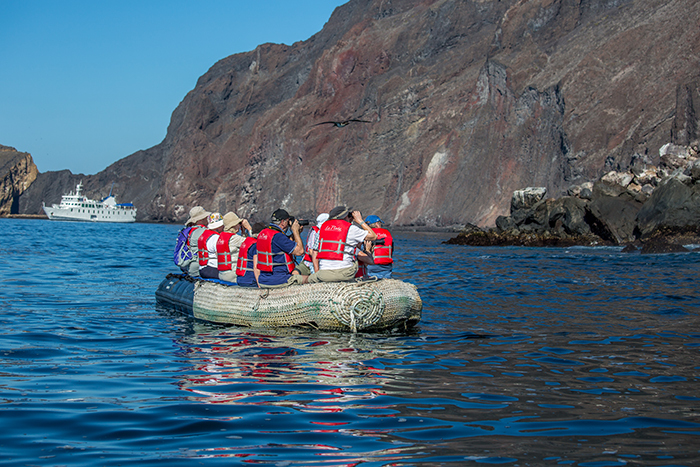 The trip was a truly remarkable experience! 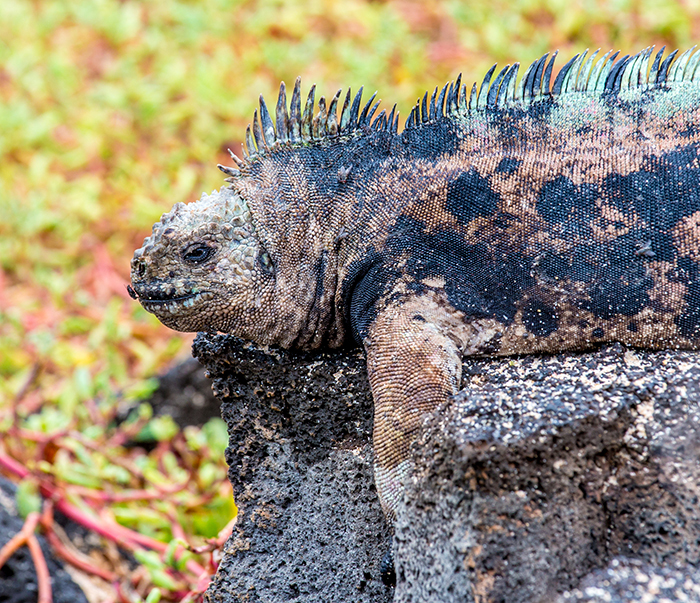 This entry was posted in Galapagos 2017, Travel by Salley Mavor. Bookmark the permalink. 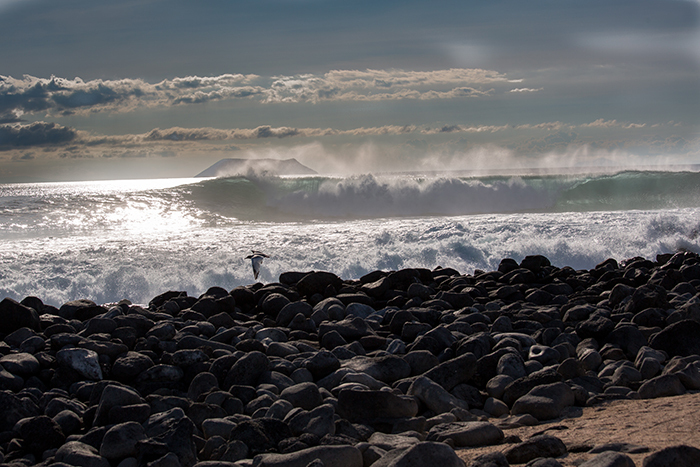 Wow, what an experience for you and your talented photog. husband. So glad you shared your pictures. Thanks so much Jennifer. I will be sure to tell Rob – he is so modest about his photos and I have to coax him to let me share them. What an amazing trip!! thanks so much for sharing your pictures!! What great photos! A trip to remember forever. So glad Polly got to go. 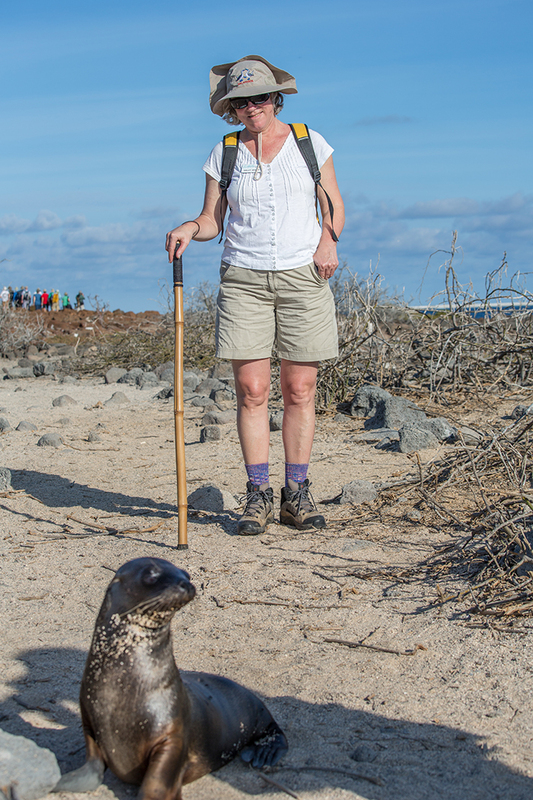 She would have looked great near a blue footed boobie! Wow! Thank you SO much for sharing! 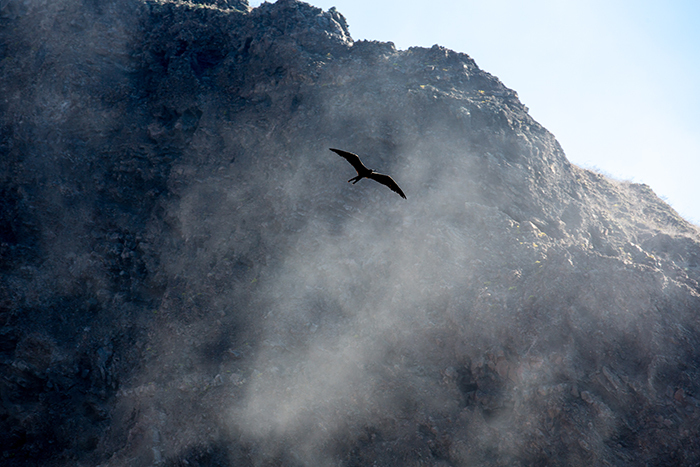 Being unemployed at 69 did my travel wishes in…..to sit here and see your photographs is an incredible travel for me. 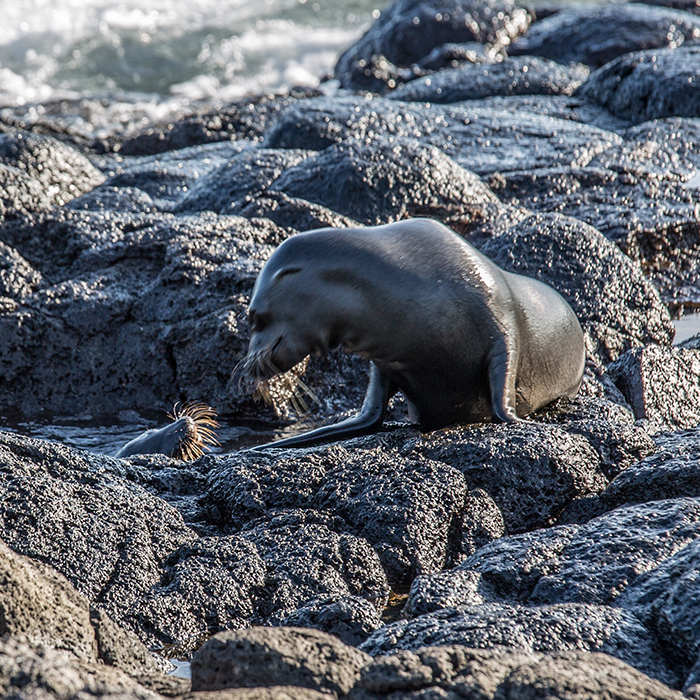 I have a cousin who traveled to the Galapagos several years back and her sister had a house on Block Island…but never have I seen such vivid photographs of either………the elephant seals, the prismacolor crab!!! and the quiet wandering at different lights of day just take me away and leave me with happy lightly hugging refreshment!!!! !…..my art school and education do give traveling abilities to my eyes !…..and hopefully each two years I do get to Los Angeles to see family, and I do get driven up coast to see my extra home of Cambria at the start of the Big Sur stretch of the coast…..especially (we soak (visually) in the elephant seal rookery close to the Piedras Blancas Lighthouse and Hearst Castle and the tidal and rock pools of Cambria………..somehow rocks from there seem to be all around me here in Kentucky, imagine that! Oh, Mary, your descriptions are wonderful and I’m so glad that you enjoyed the tour! Thank you so much, Salley, Polly and Rob. These photos are amazing! Thank you for sharing your adventures with us. The photos are sensational! It sounds like the trip of a lifetime. Thanks for letting us see…. Beautiful photos. Thank you for sharing.